A store displays banners and placards announcing its closure in Washington, D.C., in 2011. One vacant shop and another shutting down in Los Angeles in 2009. Talk to anyone in Silicon Valley these days, and it’s hard to go more than two minutes without hearing about “disruption.” Uber is disrupting the taxi business. Airbnb is disrupting the hotel business. Apple’s iTunes disrupted the music industry, but now risks being disrupted by Spotify. Listen long enough, and it’s hard not to conclude that existing companies, no matter how big and powerful, are all but doomed, marking time until their inevitable overthrow by hoodie-wearing innovators. But recent research suggests that established businesses have less and less to fear from would-be disruptors. This is partly because, as I noted this spring, fewer Americans are launching businesses. In the late 1970s, according to data from the Census Bureau, 15 percent of all U.S. businesses were startups, meaning they had been founded in the past year. 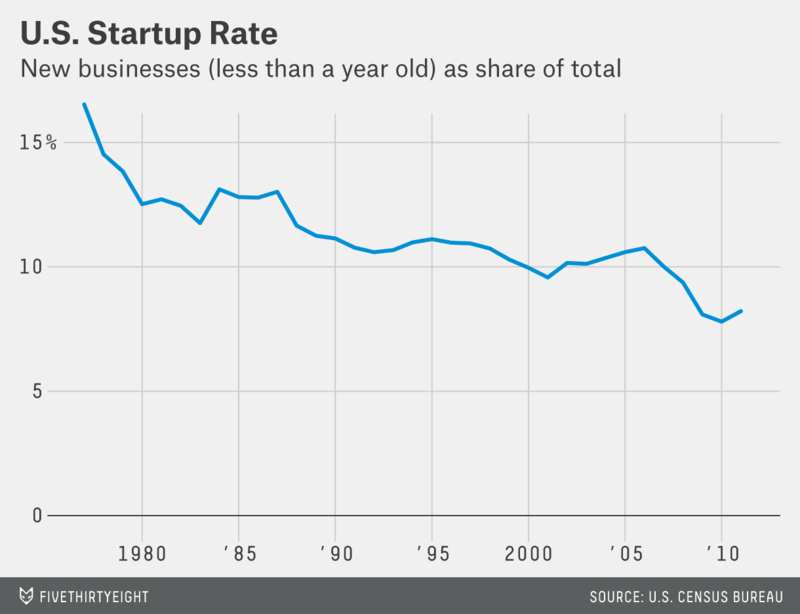 In 2011, the latest data available, the so-called startup rate had fallen to 8 percent. Measured in terms of employment, the drop has been even steeper. 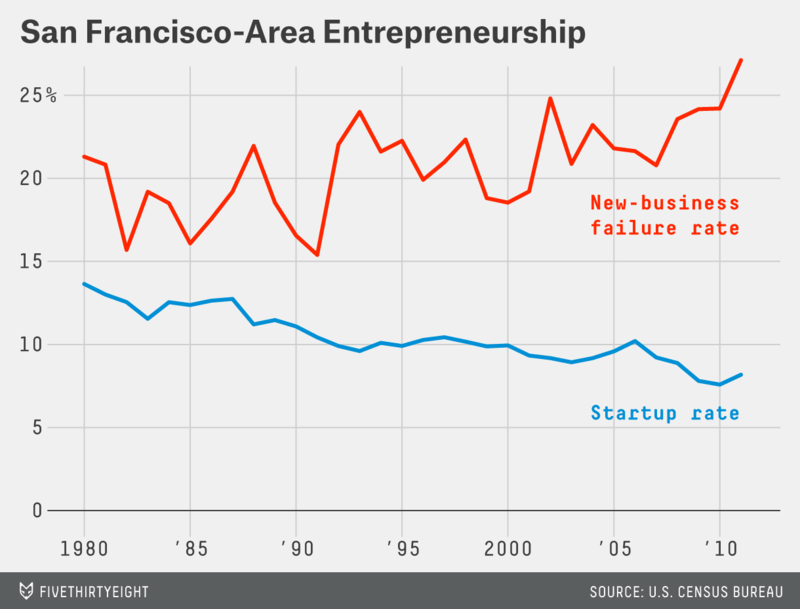 But the issue isn’t just that there are fewer startups. It’s also that fewer of them are succeeding. In 2011, more than 27 percent of new companies went out of business in their first year, up from about 20 percent two decades earlier.3 Even companies that do make it to their first birthday are failing at higher rates than in the past, though that trend is more recent and hasn’t been as steady. The only groups of companies that haven’t seen their failure rate rise meaningfully, Hathaway and Litan found, were ones that had been in business more than 15 years. In other words, the advantage enjoyed by incumbents, always substantial, has been growing in recent years. In 2008, for the first time since records have been kept, and likely for the first time in U.S. history, more Americans worked for big companies — those with at least 500 employees — than for small ones. 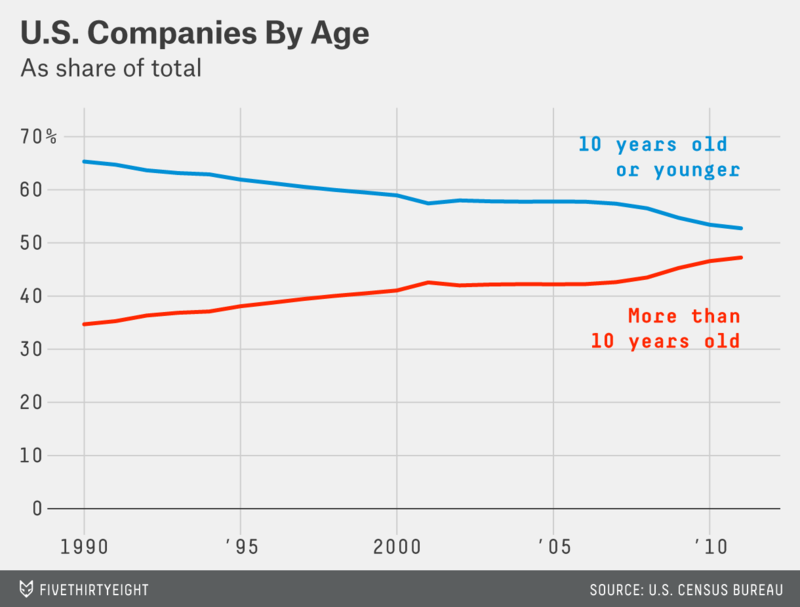 In the late 1980s, two-thirds of U.S. companies were 10 years old or less. In 2011, only about half were. Large companies are becoming more dominant in part by buying up their rivals. Hathaway and Litan find that, not surprisingly, most major industries have become more consolidated over time, as Wal-Mart and Starbucks have displaced corner stores and coffee shops.4 It’s a lot harder to compete with a multi-billion-dollar multinational company than with an independent business. 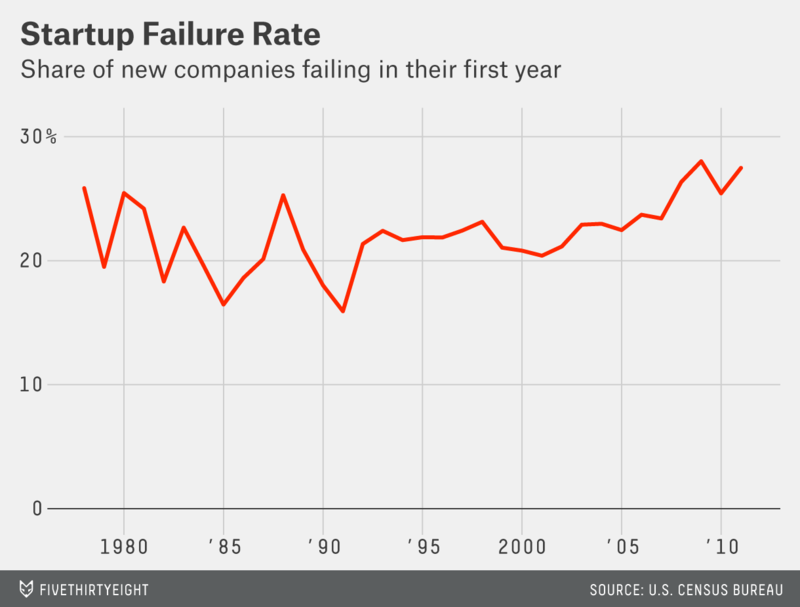 Consolidation could explain at least part of the rising failure rate among startups. There’s at least anecdotal evidence that big conglomerates are snapping up their most promising competitors before they get a chance to become a real threat. Facebook, for example, paid $19 billion for upstart messaging service WhatsApp earlier this year in what was widely seen as an attempt to head off a nascent competitor. Moreover, consolidation has been particularly strong in the finance sector, which could be sending ripple effects through other industries; community banks, which are a key source of financing for many startups, have been steadily subsumed by giants like Bank of America and Wells Fargo. Consolidation would be, on some level, a comforting explanation for the decline in entrepreneurship, because it would suggest that much of the drop has been among small, relatively inefficient businesses. The disappearance of corner stores and other mom-and-pop businesses might have worrying sociological consequences, but from a purely economic standpoint, it’s largely good news. Big companies not only tend to be more efficient, they pay higher wages and offer employees more room for advancement. Economists are much more interested in a specific kind of entrepreneurship: the comparatively small group of fast-growing, innovative startups that drive productivity and jobs growth. Any explanation, then, has to be broad enough to explain an entrepreneurial slowdown that has lasted for decades and transcends industry and geography. Researchers have been able to rule out some of the most obvious potential answers. As I argued earlier this week, the aging of the U.S. population is, at most, a partial explanation, since the declining startup rate began at a time when baby boomers were still entering their prime entrepreneurial years. Nor does the trend reflect the shifting industrial makeup of the U.S. economy, such as the long decline in manufacturing and the rise of the service sector. In fact, that shift should have had the opposite effect: Startup rates tend to be higher in the service sector than in capital-intensive industries like manufacturing, so the shift toward a service economy would, on its own, tend to increase entrepreneurship in the economy as a whole. In another paper published last week, Decker and Haltiwanger, both at the University of Maryland, offered two categories of explanation, one more worrisome and one more benign. The more benign explanation is that something, perhaps improved technology, has made it easier for companies to become more efficient on their own. Imagine, for example, that a manager at a Home Depot in Dallas comes up with a better way of managing inventory. Thanks to better analytics software, someone at corporate headquarters is more likely to notice the improvement and be able to roll out the innovation to the rest of the chain. In that scenario, the hardware industry, and the economy more broadly, reaps the benefits of the new idea without the manager needing to take the risk of leaving Home Depot to launch a rival business. Haltiwanger, who was one of the first to document the decline in entrepreneurship, said it’s unclear which explanation is right, or whether each is playing some role. It’s hard to quantify the impact of technology in many industries, for example. And although there is some evidence that licensure requirements have become a major barrier to entrepreneurship, there’s no comprehensive list of government regulations at the local, state and federal level. But, Haltiwanger added, the evidence suggests that the pessimistic explanation is at least partly right. The post-2000 decline in high-growth entrepreneurship has corresponded with a period of weak growth in both jobs and productivity — exactly what we would expect to see if reduced entrepreneurship were leading to a broader economic slowdown. Other measures of economic dynamism, such as job turnover and geographic mobility, have declined over the same period. The U.S. economy, in other words, has become less flexible, more risk-averse and slower to react to changing circumstances. Maybe it could use a little disruption. The “old and fat” line was first used by Ryan Decker on his blog, Updated Priors. In a recent article in The New Yorker, Jill Lepore questioned the validity of the theory of disruptive innovation as developed by Harvard Business School professor Clayton Christensen. Christensen has defended his research, though he has criticized the buzzword-ification of the term. But whether or not Christensen’s theory of disruption is well founded, a large body of economic research has linked productivity and entrepreneurship. These so-called deaths don’t include companies that were acquired and kept operating under their new owners. Hathaway and Litan find that consolidation isn’t directly causing the aging of American businesses, but say it could be having an indirect effect. Decker has a less technical description of this finding on his blog. The working paper itself also provides additional evidence that the incumbency advantage is growing. As one would expect, more-productive startups are more likely to survive than less-productive ones. But that effect has weakened since 2000, suggesting that even truly innovative businesses are struggling to break in. One intriguing issue here is the impact of the Affordable Care Act, which in theory could make it easier for people to leave jobs to start their own businesses. It’s still too soon to know whether that’s actually happening, however.